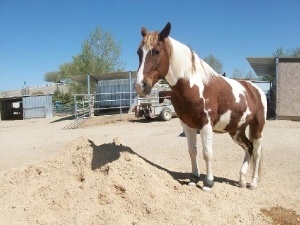 SINGER was surrendered to San Luis Obispo County Animal Services after an officer responded to a complaint of 2 underweight and neglected horses whose feet were very long and cracked. They spent about 10 weeks with Animal Services with no adoption prospects in sight and Animal Services wanted them out of there as soon as possible. 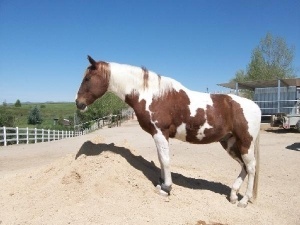 A member of HEET (Horse Emergency Evacuation Team) was asked to find a suitable sanctuary for him and his partner, Mia, who was euthanized shortly after her arrival. She had a severe case of navicular that nothing could be done about; it was too late for her as.she would have always been in great pain. Singer is still at Heaven Can Wait to live out the rest of his life.